I showed y’all My New Backyard and promised some tutorials. One thing I did was to block print some fabric with a chevron pattern. I couldn’t find a fabric I liked to cover the cushion with, I wanted a linen with a sort of handmade feel to it. So I block printed my own. Then I sewed it into a cushion cover (using the exact same method as I did in my tutorial on sewing a crib sheet, with the measurements adjusted to the measurements of the seat cushion). First you’ll need a few supplies. You need to create a block with your design on it. 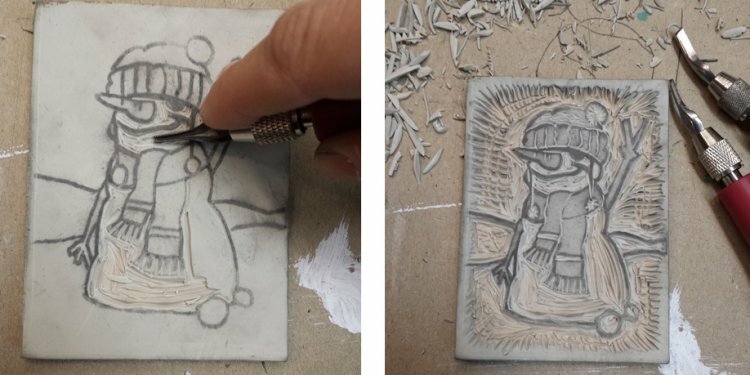 I’ve seen people use cardboard, but it’s easier in my opinion to actually do it the OG way and make a linoleum block. You can buy a linoleum block at amazon for around $5 (depending on the size) or any art supply store in a variety of sizes. You’ll also need a cutting tool, some tips, an ink roller and a tray for your ink. You can buy a complete starter kit with everything you need for $17 here: Speedball Block Printing Starter Kit. That includes the lino handle (cutting tool), a variety of different tips for it, some ink (only for paper though), and a foam tray and roller to apply the ink to your block. And you’ll need some fabric. I used linen in bleach white from Fabricworm.